Use of our spacious bridal suite 1 1/2 hours prior to your ceremony. Use of Gazebo and outside archway, all of which overlook the golf course and are nestled together surrounded by beautiful plantings. Chairs set up outside for your immediate family and/or elderly. In the case of inclement weather we also offer our indoor facility with indoor archway and chairs. You may choose to have your ceremony indoors or outside. As a thank you for your service to our country, if either the bride or the groom is in active military service we would like to offer a 10% Military Discount on your dinners for your wedding reception (not to be used with any other discount). Please ask our Bridal Coodinator for more information about Military Discounts. We have been proudly hosting Weddings since 1983 and we want your special day to be as perfect as possible. As you can imagine, over the years we have come in contact with many exceptional vendors - DJ's, Wedding Cakes, Photographers, Flower Shops, etc. Please be sure to ask us for referrals to some of these vendors which we consider to be outstanding and extremely worthy of your business. NEW!!! UPLIGHTING!!! Offered to every Wedding Reception at no extra charge! 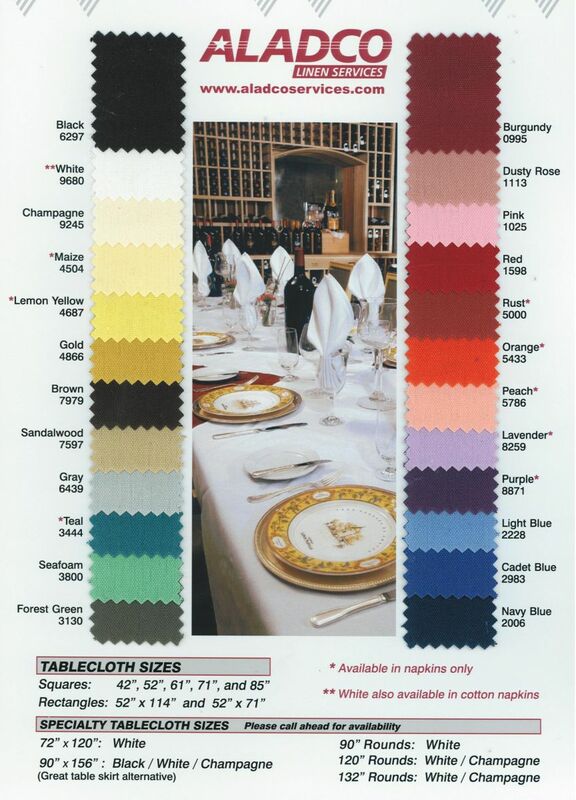 Select the colors you want for your wedding reception! Be sure to ask for a demonstration of this new and exciting feature and remember - It's Free! 4" Floral Rings make a nice enhancement to our lanterns! We do NOT supply Chair Covers - Please ask us for a referral to an excellent Vendor who provides Chair Covers with exceptional quality and service. All banquets having a cake may have the cake served as a dessert at no additional charge or may have it wrapped in napkins for their guests to take home. If the cake is to be wrapped, you must provide your own napkins. We will provide toast glasses for your guests. If special toast glasses are desired for the guest(s) of honor, that is up to you to provide. Enhance your Wedding or Function with an Audio/Video Presentation. Price to rent system is $200. Price includes use of projector, screen and/or our house PA system for the duration of your function. Audio/Video system will accomodate most Computers, DVD players, VCR's etc. We provide input jack, projector, 8' X 8' video screen and tie-in to our house PA system. All components hooked up to Audio/Video system must be approved by management and must be components the Audio/Video system is designed to accomodate. User will make no changes to the current design of the Audio/Video system. A signed contract is required to rent this system. Please ask the Banquet Coordinator for more details. We have installed an 8' X 8" Video screen and Projector that links into our house PA system allowing you to show your favorite video presentation or film with sound! All you have to do is plug in your device (Computer, DVD Player, VCR, etc.) and push play - it's that simple! Be sure to ask our Banquet Coordinator about this great new feature.